Available in your choice of 10K, 14K, or 18K white gold, this 3 and 1 diamond and white gold heart ring from Apples of Gold Jewelry combines a lovely design with four diamonds to create a stunning ring that you will want to wear every day! The gleaming white gold band makes way for a heart on the front of the ring, and inside the artistic heart are four diamonds! The three glittering diamonds on the side of the heart are 0.02 carats each, totaling 0.06 carats, while the center diamond is 0.05 carats. Altogether these diamonds offer a sparkling 0.11 carats, and are rated G-H for color and I1 for clarity. 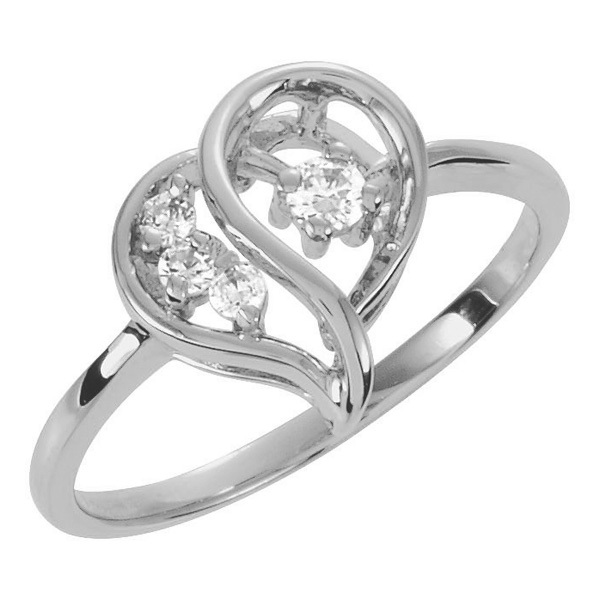 We guarantee our 3 and 1 Diamond and White Gold Heart Ring to be high quality, authentic jewelry, as described above.